Orthodox icons and chants from 100 cultures around the world!!! Topic: Orthodox icons and chants from 100 cultures around the world!!! Re: Orthodox icons and chants from 100 cultures around the world!!! Please, for the love of all that is good, do not copy the above post! One posting of all those pictures is enough for our limited bandwidth. Thanks for the photos, Seraphim. Oops! Sorry, I didn't even think about that. Please feel free to delete the large image if it is causing OC.net any problems. I don't think we'll have any problem with just one copy of the photos sitting on our database, but then Fr. Anastasios is the expert on that, not I.
i clicked on "indonesia" and it featured a korean image of the theotokos. Beautiful work. God bless your service! Cyber-anathemas split and moved here. Keep it civil, folks. Tangent about what is or isn't an icon and condemning each other moved here. OK, I have to say that this aspect sorta ticks me off. It seems like a misrepresentation to me, not a "hope." Great looking site but... no Italian? Samkim, yes we had this discussion months ago via PM on the forum. I asked you if you could help me find an Indonesian icon, but you never responded, so I just kept the Korean one until I could find a replacement. I did eventually find another icon to use, but I had forgotten to upload it to the website. Indonesia is central along ancient trading routes between the Far East and the Middle East, resulting in many cultural practices being strongly influenced by a multitude of religions, including Hinduism, Buddhism, Confucianism and Islam, all strong in the major trading cities. The result is a complex cultural mixture very different from the original indigenous cultures. By the way, the chant used in the Indonesian section was recorded from a DVD of the Divine Liturgy which a small parish in Indonesia graciously sent to me (at great cost, I’m sure) after I contacted them and inquired about Orthodox Indonesian chants and icons. Michał, yes, you did email me with some very helpful links to good resources, such as the Polish chant and Indian icon which are now on the OrthodoxMysteries website. You also made a good suggestion to put a footnote clarifying that the Assyrian section doesn’t represent the “Assyrian Church of the East” (Nestorian), but Orthodox people in or from that region/culture. You also made a few technical suggestions, which I acted upon. I was very grateful for all this, and sent you letters of appreciation. And here comes another problem of this site. There is no distinction made between EO and OO whatsoever. We, EO, share much with OO, but we are not one Church, at least not yet. And the site suggests otherwise. It's nothing more but giving people false information. I also told you that I would put information about OO/EO on the site when I had time to figure out where and how to put the information in. I eventually decided to put this topic in the FAQ and Links sections. And putting a vagante group (http://orthodoxmysteries.com/video-french.html) which consciously rejected canonical Orthodoxy (both Eastern and Oriental) under the label "The Orthodox Church of Jesus Christ" is scandalous. Every large mustard tree starts as a tiny mustard seed. WHAT!? OO and EO BOTH the ONE Orthodox body of Christ? I literally laughed so loud when I read this that our neighbors down the street heard me through the window! LOL! Yeah, even though I know of some links to the Liturgy in Italian, I figured adding an Italian section to the Orthodox world-map would be waaaaay too confusing. ...to judge Seraphim's attitude rather than merely critique his work is uncalled-for. Thank you, Peter. I don’t think people stop to consider that I’ve literally spent thousands of hours laboring to assemble this site. Thank you both so much for all your help! You both have been a great assistance in connecting me with many resources and material for the site. The Lord bless you! Samkim, yes we had this discussion months ago via PM on the forum. I asked you if you could help me find an Indonesian icon, but you never responded, so I just kept the Korean one until I could find a replacement. Michał, I had absolutely no idea this was not a canonical group. You could have just informed me without all the criticism. I wanted to. But the thread just popped up on OC.net, so I decided to write here. Sorry, if I expressed my critisim to harshly. The problem is that - correct me if I'm wrong - most of these painting weren't made by Orthodox, weren't made for Orthodox and have never been used by Orthodox. I guess that they were simply added to the site because they were fitting to particular cultures. But it gives a completely wrong impression of Orthodox missionary work. Adopting culture of a missionarised group in the field of iconography and even chanting isn't how it is done by us. We rather bring our big and small traditions and let the new people make something out of these in connection with their own culture. It's an organic process! If I may add something to this. In many sections of your website, you put icons which are especially venerated by particular people. In other sections, you put "icons" which reflect appearance and/or culture of particular people. This may be confusing. In Polish section (http://orthodoxmysteries.com/chant-polish.html), you added an icon of the Black Madonna because we especially venerate it (thus expressing our love for the Theotokos). And in many African sections you inserted another "Black Madonnas" but for a very different reason. - that we see the Byzantine Catholic Church as a part of the Eastern Orthodox Church. Please, have a look at Ethiopian and Eritrean sections (http://orthodoxmysteries.com/chant-ethiopian.html, http://orthodoxmysteries.com/chant-eritrean.html). Did the original African Orthodox people make their icons look ethnically Ethiopian/Eritrean? No. Although they made them in a non-Byzantine style. Please, have a look at this pdf file: http://www.stpaulsirvine.org/TanzaniatheSecondTimeAround_revised_.pdf. Did Eastern Orthodox missionaries give the people of Tanzania Tanzanian looking icons? No. They simply gave them Byzantine icons with captions in Swahili. 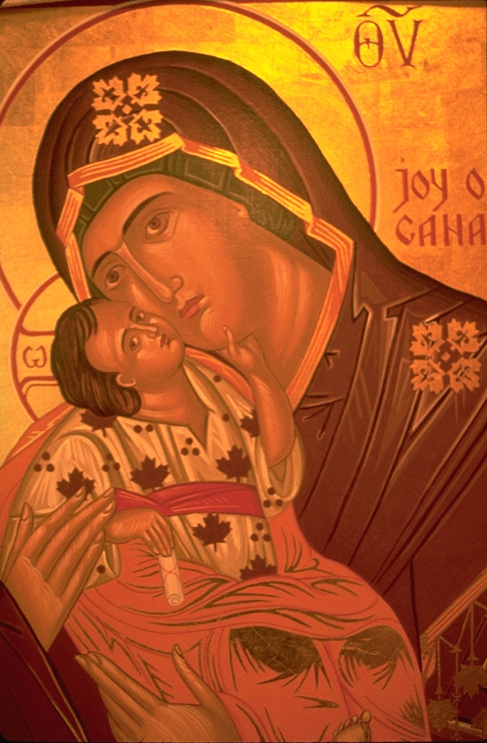 Please, have a look at this icon: http://www.orthodoxcanada.org/joyofcanada/joycan.jpg, http://www.culture.gouv.fr/culture/noel/imatges/joycan.jpg. Did the Canadian Orthodox make an image of the Theotokos reflecting their Anglo-Saxon origin (http://orthodoxmysteries.com/images/chant-icon-canadian.png)? No. They simply made a Byzantine style icon with maple leafs on the ornaments. Dear _Seraphim_, I hope you will try to keep higher standards of Orthodoxy on your trully beautiful and valuable website. The Ethiopian Orthodox Church ARE the original Orthodox Christians of Ethiopia (since the fourth century) and their icons have always reflected their culture in much the same way that Coptic Orthodox icons have always reflected Egyptian culture. I would be interested to witness any evidence you may have to offer of Ethiopian Orthodox iconography historically being fundamentally different to what it is today in regard to the manner in which it reflects Ethiopian culture. Michal, thank you so much for your post! These are exactly the points and arguments I have tried to make on this forum on several threads. I sincerely hope people listen to what you have to say, and learn from it. LBK, good then you can help Michal in his pursuit to prove that Ethiopian Orthodox iconography has departed from the manner it "originally" was according to the way it reflects Ethiopian culture. He needs all the help he can get. Same with languages like Faroese. Just a reading of the Lord's Prayer. EA, pardon me asking, but re "Ethiopian Orthodox", do you mean Chalcedonian or non-Chalcedonian Orthodox? Non-Chalcedonian iconography is an area I know little about, other than that in recent centuries it may have been (was?) heavily influenced by Roman Catholic religious art. I can certainly help Seraphim in showing him what (Chalcedonian Orthodox) iconography should be, and what it is not. EA, pardon me asking, but re "Ethiopian Orthodox", do you mean Chalcedonian or non-Chalcedonian Orthodox? Non-Chalcedonian. The Chalcedonian Church has only retained the Byzantine and Georgian iconographical traditions. There is no significant Chalcedonian presence in Ethiopia, and certainly no Chalcedonian Church that is genuinely Ethiopian in any sense. What about Holy Archdiocese of Aksum under Archbishop Peter? How many Ethiopians belong to this Archdiocese exactly? Did the original African Orthodox people make their icons look ethnically Ethiopian/Eritrean? No. Although they made them in a non-Byzantine style. I can't figure out if you're saying that Ethiopian iconography is acceptable or not. The Ethiopian and Coptic iconography is certainly 'ethnic' in nature, as is Byzantine iconography. The LORD and the Theotokos sure do look Greek to me in most iconography. Especially in the icons of Christ the High Priest, all decked-out in full Byzantine royal wear. What are your standards for iconography, and should all cultures be uniformly bound to them? The Ethiopian Orthodox Church ARE the original Orthodox Christians of Ethiopia (since the fourth century) and their icons have always reflected their culture in much the same way that Coptic Orthodox icons have always reflected Egyptian culture. You have completely misunderstood me. I DID say that the faithfull of the Ethiopian Orthodox Church ARE the original Orthodox Christians of Ethiopia. And I gave their icon as an example of the fact that iconography of a particular nation can be uniqe (i.e. different from, let's say, Byzantine iconography) but still not impudently ethnic in its character. Ethiopian icons, although they reflect Ehtiopian culture, are not any kind of ethnical manifestos as Robert Lentz's works are. Ethiopian icons, although having the element of ethiopiannes, do not loose their sacralness, while Lentz's "icons" do. My standard of iconography is that it should be authentic. And that can be achieved only if iconographic style of a particular nation or ethnic group developes in an organic process. If the Orthodox from Kenya or Madagascar decide to come up with black-skinned icons, that would be fine to me. But, AFAIK, they didn't do it so far. And what all the peoples new to Orthodoxy should start with is the iconography of the nation which brought Orthodoxy to them. And let's be honest, Greek or Russian icons aren't ethnic in a way that would be insulting to native people of Africa, Asia or Americas. Greek or Russian icons do not depict Jesus with blond hair and blue eyes. It would be more insulting to bring Lentz-like-style icons to the natives, because it would be like saying: "Well, silly folks, you wouldn't buy Orthodoxy if we didn't bring you these familiar-looking pictures, so here you are." Thank you for the clarification, and my sincerest apologies for misunderstanding you. Hello! I just wanted to let you know that the picture you have representing Indonesian worship is actually a Korean picture. They are wearing Hanbok, the traditional and unique Korean ceremonial clothing. Once again, please forgive me if I have any inaccurate recollection of our exact correspondence. Thank you for offering your feedback, I appreciate you sharing your knowledgeable perspective on the subject. No idea. I know only that such a thing exists. On English version of Patriarchate's site there is nothing more about the Archdiocese. OK, so what jurisdictions are the Orthodox people of Blackfoot, Cheyenne, Comanche, Mohican, Apache, Cherokee, Navajo, Choctaw, Aztec, Mayan, Hawaiian and Maori tribes under? I asked you if you could help me find an Indonesian icon, but you never responded, so I just kept the Korean one until I could find a replacement. If you are searching for an Orthodox icon of Indonesian-looking Theotokos, I doubt you will ever find one. Here is the 'Cultural Religious Practices' section of the Indonesian Orthodox Church supporting website. They write about introducing icons ("icons and relics, with a right Orthodox and biblical understanding, have replaced amulets and heirlooms that were burned when people converted to Orthodoxy"), but there is no suggestion whatsoever that these icons would be Indonesian-looking. Mamy "icons" on your webstie are not Orthodox but as far as the Persian one is concerned, I have doubts if it is even Christian. This painting looks like an Islamic piece of art. I hope I'm wrong on that one, because it would be too bad to see on an Orthodox Christian website a painting of Jesus and Mary, whose author saw Them merely as a prophet and a mother of a prophet. Scores and scores of clergy have seen this site and they love it. I don’t feel obligated, nor do I have the time, to spend every day going back and forth with you on detail after detail on a piece of work that took me half a decade to assemble. Also, if you will notice what I just posted in the Prayer Forum (11th anniversary of the Thurston High School shootings), it should be clear that I’m not really in any mood to be debating. Scores and scores of clergy have seen this site and they love it. Maybe they weren't paying too much attention to what they were seeing. And BTW, I also love it. But I hate to see any stain on the things I love. So that's why I keep on picking out potentially un-Orthodox elements in your, intended to be Orthodox, website. I don’t feel obligated, nor do I have the time, to spend every day going back and forth with you on detail after detail on a piece of work that took me half a decade to assemble. Well, my frequent writing wasn't fruitless. At least you added some clarification on the EO/OO issue (but still, I think that merely providing a link to OrthodoxUnity.org website wasn't enough after you made all the rest of your webstie as if EO and OO were one Church) and you deleted episcopus vagans video. If one day you will be in any mood to be debating, hopefully, my messages will still be here. Yeah, even though I know of some links to the Liturgy in Italian, I figured adding an Italian section to the Orthodox world-map would be waaaaay too confusing. If there are canonical Italian Orthodox communities, than what's confusing about adding an Italian section to the Orthodox world-map? Creating sections about cultures in which Orthodoxy is not yet embodied (http://orthodoxmysteries.com/images/chant-native-note.png) is way more confusing. The same thing is with presenting Chalcedonian and non-Chalcedonian Orthodox Christians as memebers of one "Orthodox Church of Jesus Christ" (that's nothing more but adhering to the branches theory which is non-acceptable for Chrstians calling themselves "Orthodox"). This is probably one of the most insensitive things anyone has ever said to me. I thought people might be interested in seeing a list of the number and location of visitors to the OrthodoxMysteries website. Dear _Seraphim_, please, don't feel offended by this: you have to come to terms with the fact that someone is actually criticising your work. If this criticism is uncalled for, please, prove it. Michał, I have no problem with people critiquing my website. Over the past 5 years hundreds of people have critiqued it in numerous ways: graphically, technically, linguistically, theologically, etc. Constructive feedback is always welcome. Last week I had logged onto the forum for one, single, specific purpose: to post in the Prayer section about the fact that my wife was going through literal hell because that day marked 11 years since her best friend in high school killed his parents and then went to school and shot everyone he could… and if my wife had been nearby she too would have been killed. I sincerely hope it is now clear to you why your words were so offensive to me. I forgive you, but I want you to have a clear understanding of the situation. I've been uncompassionate, that's true. Thank you for your forgiveness.